This house was built for Robert Andrews in the early 1880's. In 1880, he bought a part of the south half of lot 21, concession 4, from Thomas Good for $20. It was probably this piece of land that the house is built upon. Andrews was a successful tinsmith and used the house both for business and as a residence. The larger section, on the west side, was built first and was used for the business. The ground floor was a sales and display area with two large front windows while, presumably, the upstairs was used for the actual tinsmithing. An upstairs balcony [no longer there] and the upstairs door were used for bringing in materials 28. Apparently a butcher shop was later located in this part of the building. The smaller, eastern section of the house was built shortly after the western section and was used as a family residence. In 1921 the estate of Robert Andrews sold the property to Robert Dixon for $2200. Mr Dixon rented the house and among his tenants were Mr. and Mrs. Russell Parks who lived there from 1926 to 1934. In 1940 the property passed from Mr. Dixon's estate to Lulu Watson and Edna Faith who sold it to Alex Bothwick in 1947. In 1951 it was sold to Flora Cater [later Gallagher]. The building is divided into two apartments, both of which are  rented out. The old sheds which used to extend from the back of the house down to Stevens Creek were replaced by Mrs. Gallagher with an additional room. 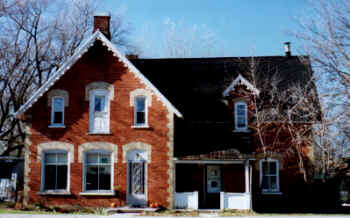 From about 1890 ,until 1934 a wooden frame building, part of which is now the Russell Parks House at 2359 Church Street q.v., stood on the same property east of the present house.29 This is thought to have been the original Presbyterian manse which was moved from its original location across the street at 2340 Church Street [q.v.] when the new manse was built there. 28 The file contains no contemporary evidence for this use of space, which on the face of it seems unlikely. The loft may well have been used for storage, but why work up there in the dark, when a much more convenient, well lighted room was available on the ground floor? Until 1926, artificial light meant oil lamps, and tinsmiths don't require much in the way of a showroom.